DURING the early months of 1942 the Japanese were on the offensive everywhere in the Southwest Pacific and their armies seemed to be invincible. On 10 December 1941, Japanese forces landed in the Philippines; on 15 February 1942, Singapore fell; within a month the Netherlands Indies were conquered. Then the attack shifted farther to the southeast, and from Rabaul in New Britain, which had been occupied on 23 January, the Japanese High Command planned a two-pronged drive. 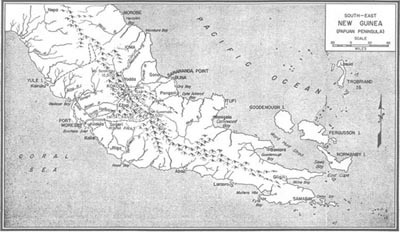 One prong was to strike for control of southeastern New Guinea; the other was to thrust through the Solomon Islands to cut the supply line from America to Australia. Neither attack reached its objective. When a Japanese convoy pushed around the eastern tip of New Guinea threatening Port Moresby and northeastern Australia, it met American naval forces. In the ensuing Battle of the Coral Sea (4-8 May 1942), the Japanese suffered a decisive defeat. Five months later, the Japanese advance toward our supply line in the Southwest Pacific ended when American marines landed (7 August) in the Solomons on Tulagi, Gavutu, Florida, and Guadalcanal. gave the United Nations their first toehold in the area of enemy defenses protecting Rabaul, center of Japanese power in the Southwest Pacific. The American part in the Buna-Sanananda campaign, in which Australian and American troops defeated "the invincible Imperial Army" of Japan, is the subject of this pamphlet. The proportion of American troops in the Allied forces at Buna was much greater than at Sanananda, and for this reason the Buna operation receives the more detailed treatment. The story is set in a background of fever-ridden swamp and jungle, where American soldiers lay day after day in waterlogged fox holes or crawled through murderous fire toward enemy positions they could not see. Despite all the difficulties imposed by terrain, climate, and the formidable strength of Japanese fortifications, despite failure in many heroic attacks, the effort was carried through to a final and smashing success. This campaign and the almost simultaneous action on Guadalcanal were the first victorious operations of U. S. ground forces against the Japanese. On 21 and 22 July a Japanese convoy of 3 transports, 2 light cruisers, and 3 destroyers reached Gona and disembarked Maj. Gen. Tomitaro Horii with about 4,400 troops. Allied Air Force attacks succeeded in setting fire to i transport. Additional troops and supplies poured in during the next few days. 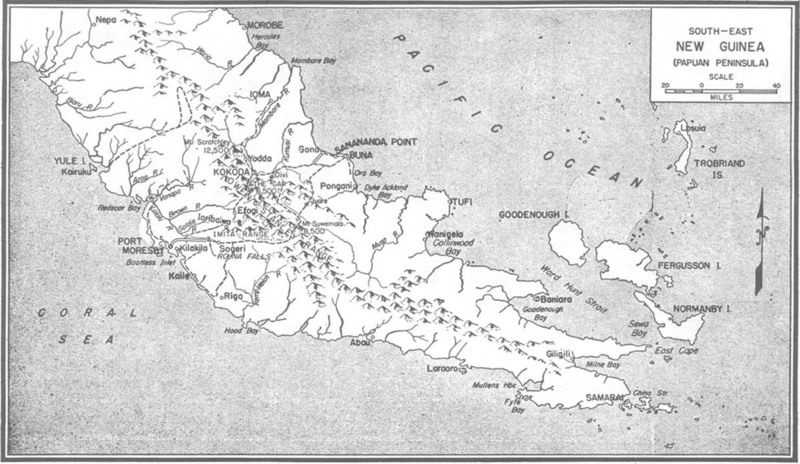 By 13 August 11,100 men had landed and the drive on Port Moresby began. The Japanese fought their way across the deep gorges and razor-backed ridges of the Owen Stanley Mountains and descended the southern slopes to within 32 miles of the port. Here Australian resistance stiffened and on 14 September the advance was held at Imita Range, south of Ioribaiwa. to threaten Port Moresby from the east, but this attack had been quickly stopped. After 3 days of heavy fighting, the enemy troops were forced back to the beach and taken off by naval vessels. For the first time, a Japanese force had been evacuated after failing in its mission. Just as the tide of invasion began to ebb, American troops entered the New Guinea theater of operations. Early in September, when the Japanese threat appeared most grave, the 126th Infantry Combat Team and the 128th Infantry Combat Team, both of the 32d Division, were ordered to Port Moresby from Australia. Each combat team was composed of a regiment of infantry, a platoon of the 114th Engineers, a Collecting Company and a platoon of the Clearing Company of the 107th Medical Battalion with three 25-bed portable hospitals, and a detachment of the 32d Signal Company. The infantry howitzers, divisional artillery, and about two-thirds of the 81-mm mortars were left behind because of the difficulties of transportation to the Buna area. The 32d Division was a National Guard unit from Michigan and Wisconsin, commanded at this time by Maj. Gen. Edwin F. Harding. It had been sent to Australia in April 1942 and had there received a very brief and sketchy training in jungle warfare. Though the Buna-Sanananda campaign was its first combat experience in World War II, the division could look back on an excellent record in World War I when it had been one of the first units to reach France. 1. The 127th infantry Combat Team disembarked at Port Moresby almost 2 months later, on Thanksgiving Day. On 27 December, the 163d Infantry reached New Guinea from Australia. This unit of the 41st Division was also a National Guard Regiment sent to Australia in April 1942.
cated that no enemy reinforcements were reaching the Buna-Sanananda area. The enemy was apparently concentrating all his available naval, air, and land strength on the battle then raging in the Solomons. If he could drive us from Guadalcanal and advance southward to cut our supply line to Australia, his relative neglect of New Guinea would be justified. On the other hand, determined action on our part might crush the enemy in the Papuan Peninsula and so remove permanently the Japanese threat to Port Moresby. 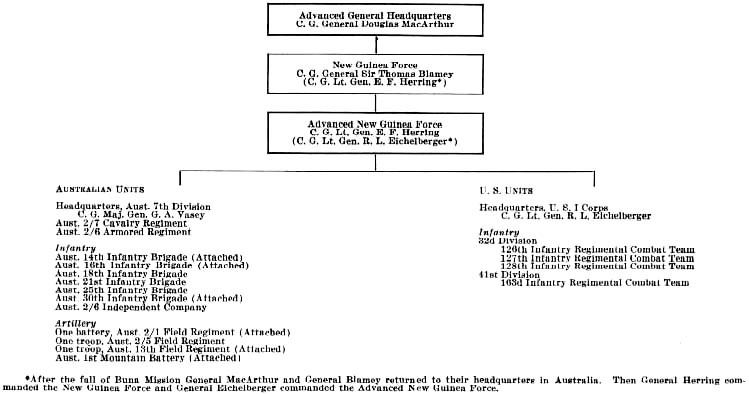 General Douglas MacArthur, Commander-in-Chief, Southwest Pacific Area; General Sir Thomas Blarney, Commander of Allied Land Forces, Southwest Pacific Area and General Officer Commanding New Guinea Force; and Lt. Gen. E. F. Herring, General Officer Commanding Advanced New Guinea Force, all of whom were at Port Moresby, laid their plans accordingly. While the Australians continued to drive the enemy back along the Kokoda trail, the 32d Division under General Harding would make a secret, wide envelopment to the east and attack in force on the enemy left flank in the vicinity of Buna. This move might cut off the retreat of the main Japanese force facing the Australians. To insure speed and to avoid dissipating the strength of the division by marching it- across the exhausting mountain trails, most of the enveloping force was to go by air to the seacoast southeast of Buna. During the remainder of October and the early part of November, the 126th Infantry and the 128th Infantry were moving into position. Acting as left-flank guard, the 2d Battalion of the 126th Infantry crossed the lofty Owen Stanley Mountains on foot by a rugged trail rising over 8,000 feet. On 20 November, after an exceedingly difficult march of 5 weeks, they reached Soputa. The 128th Infantry on 14-18 October was flown to the hastily improved air strip at Wanigela Mission on Collinwood Bay, 65 air miles from Buna. From Wanigela small 20-ton motor launches carried the regiment up the coast to Pongani, 23 miles from Buna, where it halted to construct a landing strip. The 126th Infantry, less the 2d Battalion and part of, the 1st Battalion, went directly by air to this new strip on 9-11 November. approach to the enemy, and therefore from 10 November the troops advanced as rapidly as possible. By the evening of 18 November the forward movement had brought our forces close to Buna (Map No. 3, facing page 9). 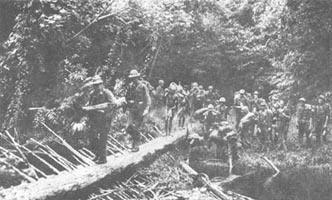 The 1st Battalion, 128th Infantry, was on the coastal track between Hariko and the Duropa Plantation; the 1st Battalion, 126 Infantry, was coming up from Oro Bay along the same trail. The bulk of the 126th Infantry was in position on the left in the vicinity of Inonda. Beyond was the Australian 7th Division pushing forward on the trails to Gona and Sanananda. The 3d Battalion of the 128th was near Simemi; the 2d Battalion, in division reserve, was split between Ango and the grassy plain at Dobodura. Here E Company and the Cannon Company were working at top speed with a detachment of the 114th Engineers to construct a landing strip needed for transport planes and fighters. Speed was vital if the division was to eat, for on 16-17 November two enemy air attacks on our small boats had crippled the coastal line of supply. Enemy patrolling to our front had increased during the past few days, but despite this activity, the garrison in Buna appeared to be very weak. Native reports indicated that the Japanese had retreated to the landing strips at Buna. The men of the 32d Division expected to end the campaign with one quick attack and advanced full of enthusiasm. A month later, still facing Buna, our troops would look back with envy on the relatively easy days of the approach march, when they had slogged along muddy trails and waded breast-high streams. On the Way to Buna: The Inland Route. Men of M Company, 128th Infantry, on the trail between Dobodura and Buna.